SilentMode here. What follows is probably my most difficult review to date: not only am I in a bit of a sour mood, but I also have to put aside my personal opinions on marriage (which means most of my material has to be thrown out! ), given that many AFOLs on here and elsewhere have significant others. I picked up this set during the Brick Friday promotion at Westfield London’s Lego store (the one in Shepherds Bush); I had noticed it at the last minute and thought it would be great for a review. I have two of these sets: the one you see above and one going in the vault. 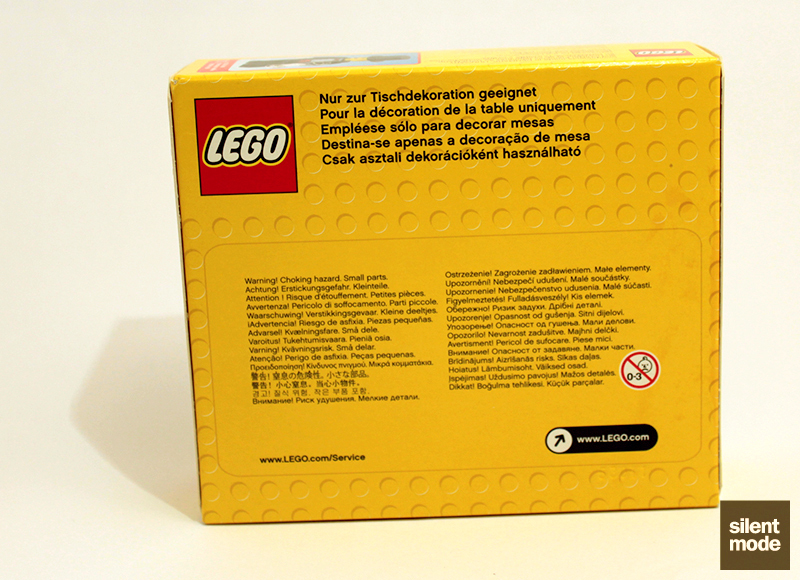 Going by some of the prices I’ve seen for this set, it looks like it was previously an exclusive (it was first found in Legoland California at USD 9.99 according to Brickset) – but currently on feeBay it’s listed at upwards of GBP 10. Although I’ve managed to set up a multi-million pound photographic studio to help take better pictures, white balancing still hates me. The box itself surprisingly has very few details on it. If it weren’t for the picture on the front, one could easily miss it on the shelves. Here’s the back of the box, containing only text. 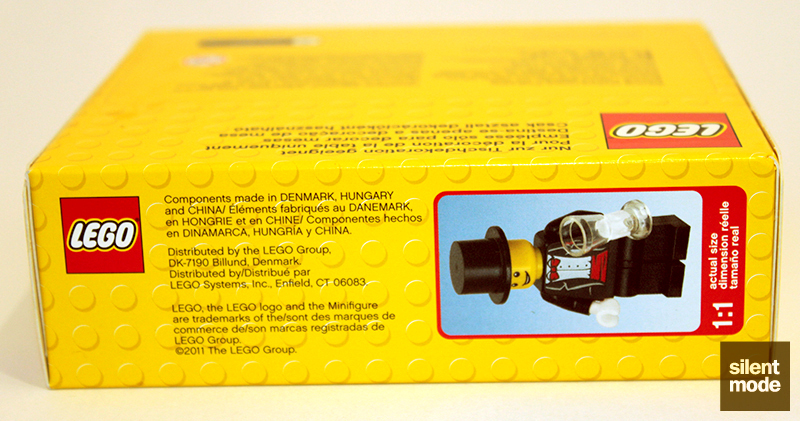 …and reveals the set contains components made in China. 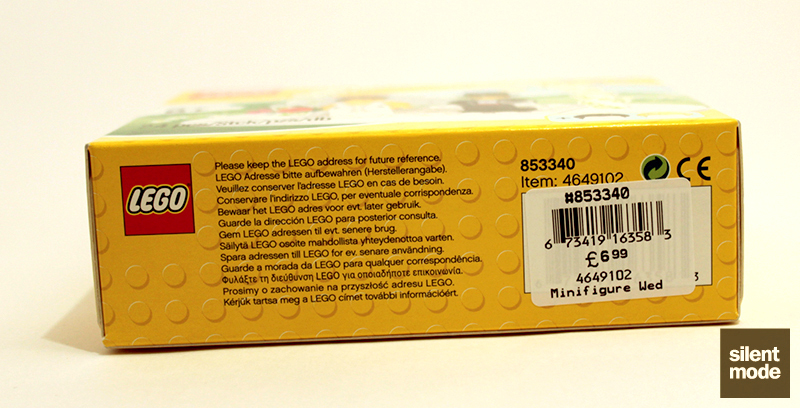 The other long side has the barcode (with the price of the set), along with more multilingual legalese text. 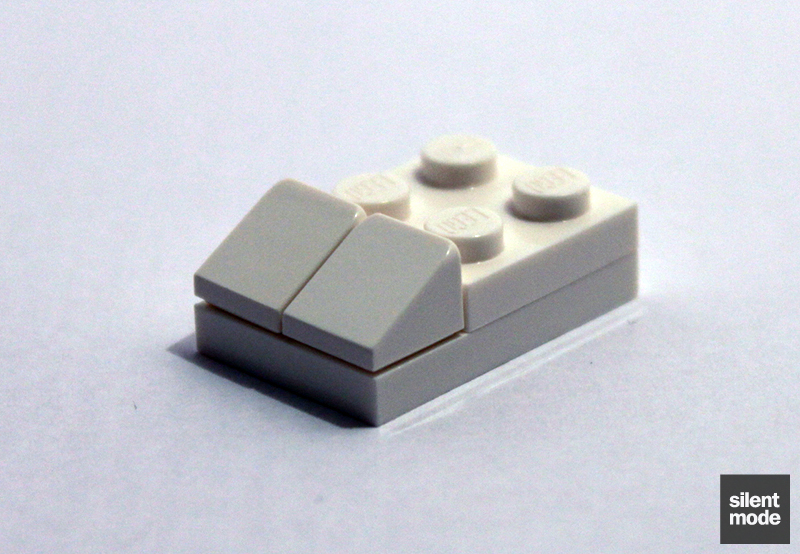 Both the short sides are plain, except for the Lego logo. As you can see from this picture I had some difficulty opening the box. 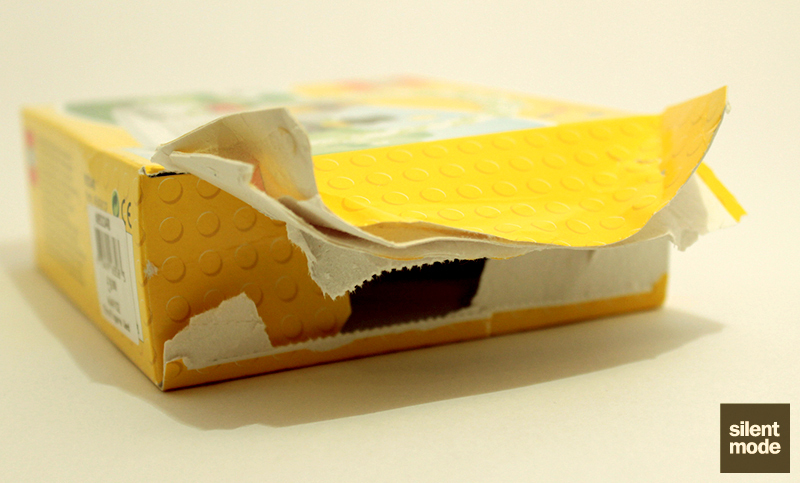 You’ll notice it’s made of slightly thicker card than usual – around half the thickness of larger boxes – and there are none of those opening tabs at the back. 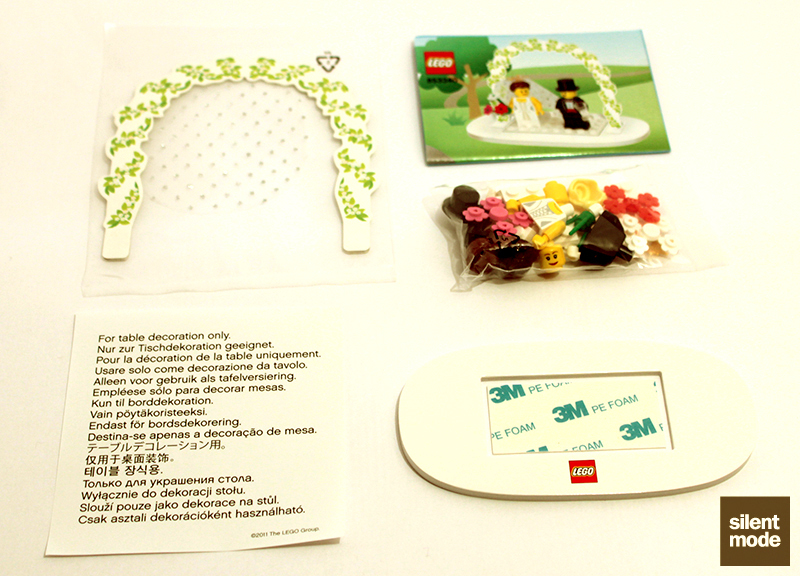 This is what you get inside the set: one bag containing all the Lego elements, a larger bag containing a floral arch and veil, a non-Lego card-like base and a little pamphlet. The pamphlet says: “for table decoration only”. 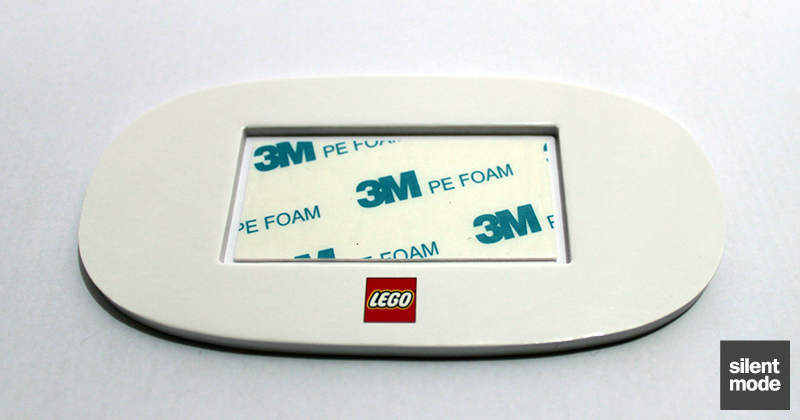 This is the base that holds the Lego display, with an adhesive pad made by 3M. I’m not crazy enough to actually use it. The large circular veil with little dots is headwear for the bride. The arch is made from a similar foamy material to the base. 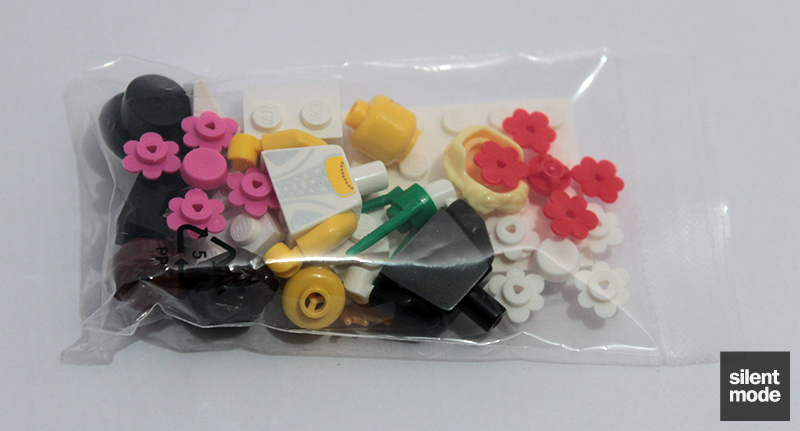 Most importantly, all the Lego elements come stuffed into this little bag – fortunately none of them were damaged. Almost forgot: we also get this instruction pamphlet. Exactly the same picture as on the box is shown here. 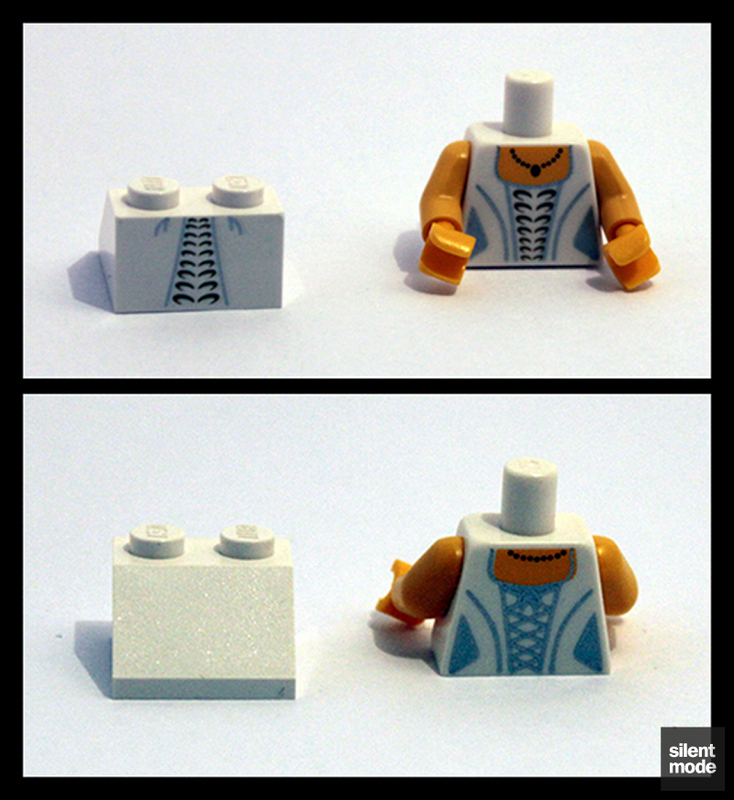 Excluding the minifigures and their headwear, this is pretty much all you get in the set. With a set this small it’s probably not worth picking out the “stars of the show”. I’m pretty sure the torso uses the same bridal dress design showcased at AFOLcon earlier this year, as part of the large Westminster Abbey model built to celebrate some royal wedding that took place around that time. Unfortunately the only pictures I have of that display were from the side. NOTE: I’ve since been corrected – the bride torso in this set is exclusive, while the bride’s torso in the display below will be making an appearance on the S7 Bride. Of particular note above is that the printed slope is only one brick high, as opposed to the usual two brick high slope often used for female skirts. 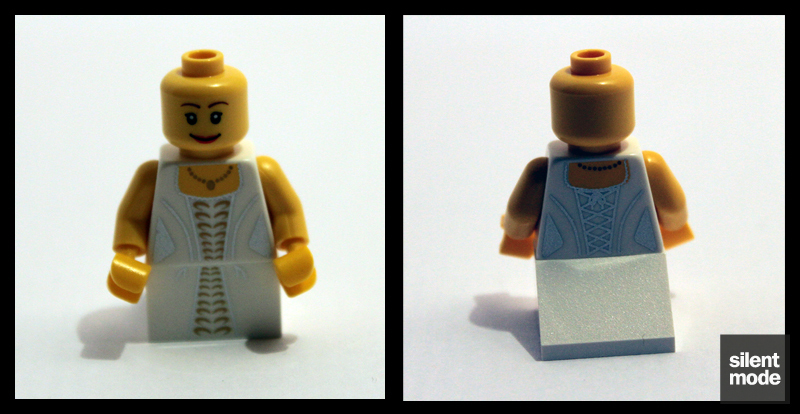 As with most weddings, the majority of attention is given to the bride in this set. First of all, the front of the box hints that the bride has not just one, but three hairpieces to choose from: blonde, brown and brunette. They are all the same braided style, with a hole on top for the tiara (on the left). My initial thought was that they might as well have gone the whole nine yards, by including tan, redhead and black variants of the hairpiece. I think, for the purposes of this set, that three hairpieces is more than enough, however. 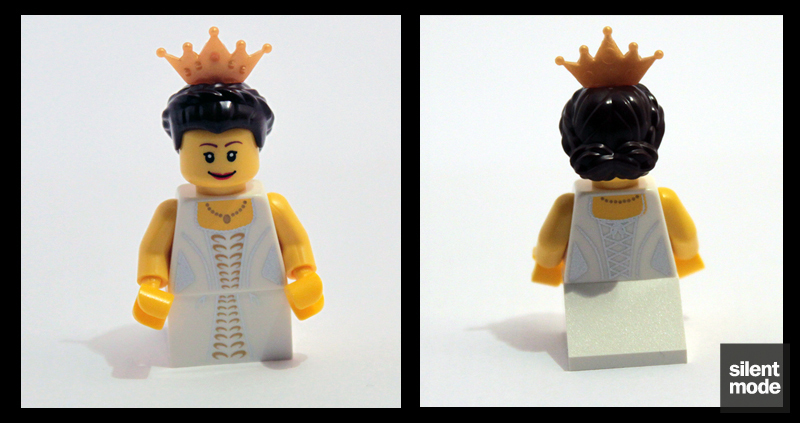 Here’s the bride in its initial assembly with the brown hairpiece. Usually the 2x2x2 slopes make female figures look Amazon-like compared to the men, but with the 2x2x1 slope she looks a little short – almost like a bridesmaid. 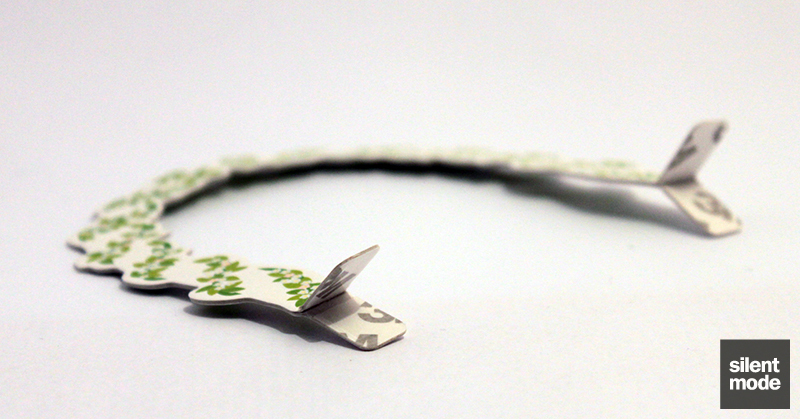 You’ll also notice, quite disappointingly, that the design doesn’t line up on the two parts. .. and Gail Porter varieties. Then I realised, when constructing the set, that the white plates and cheese slopes would be used to give the bride some added height. Yes indeed: this guy is basically the S1 Magician, without his moustache or his magic wand. His head is also single-sided, and the only accessory he gets is his top hat (which I’m not sure grooms even wear), and perhaps the empty transparent goblet he’s pictured with on the box. Very unusual about these instructions is that there’s no advertising whatsoever for other sets. I guess it’s because, apart from possibly being an exclusive set, there isn’t really anything else related. Possibly the Grand Emporium could be advertised, but there’s not enough room. 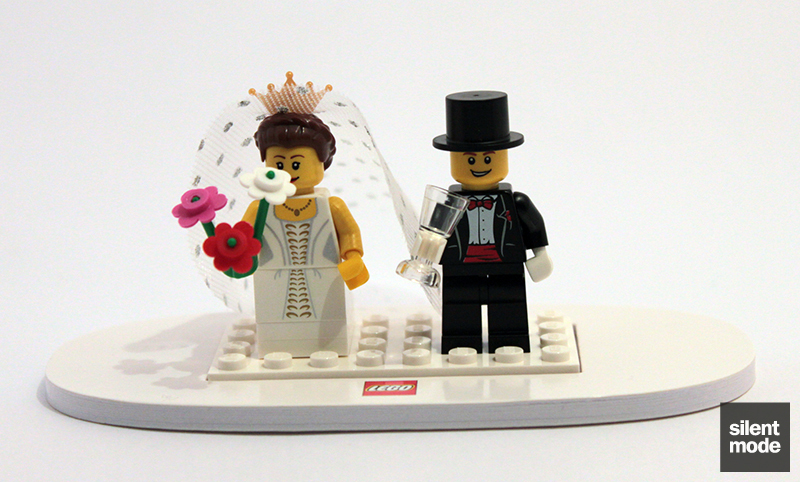 Here are the bride and groom positioned on the white 4×8 plate. The bride is now holding a bouquet of flowers, ready to toss into a ferocious crowd. The 4×8 plate slots into the base as such, and is meant to be held in place by peeling off the adhesive backing beforehand. I haven’t done so because I want that plate! For some reason I keep thinking it’s The Sun logo printed on that base, instead of Lego. 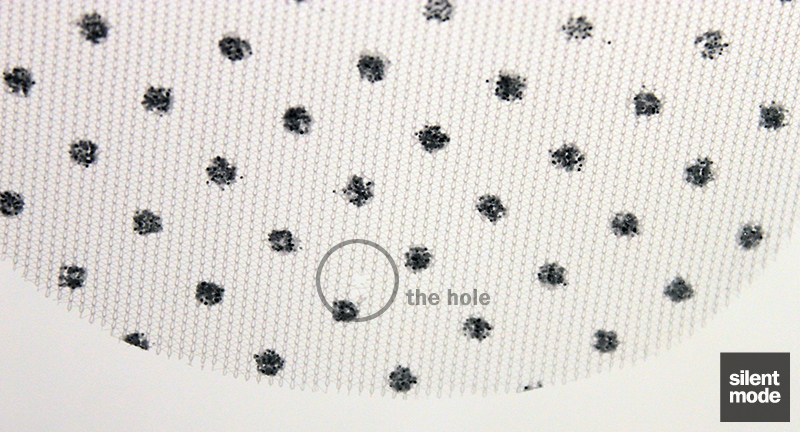 The arch also has adhesive pads, located behind those white tabs. These fold outwards to provide a surface to attach the arch to the base. 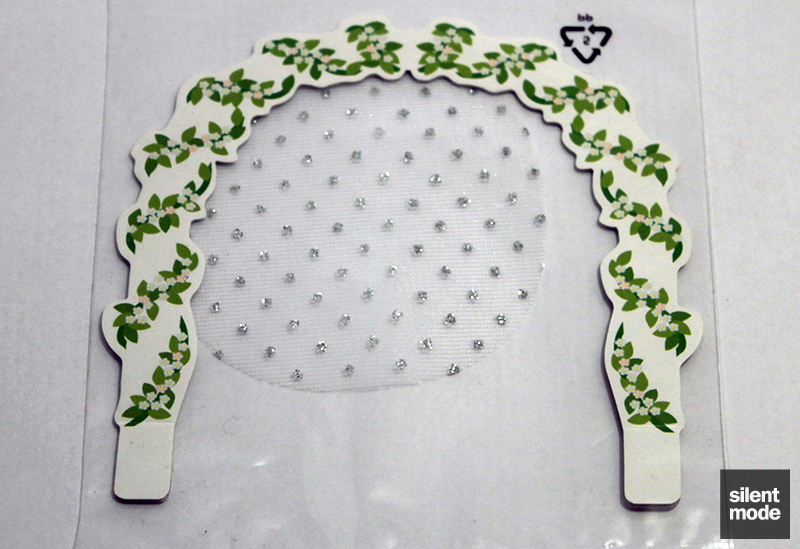 The display would look something like this with the arch attached, thus completing the build. 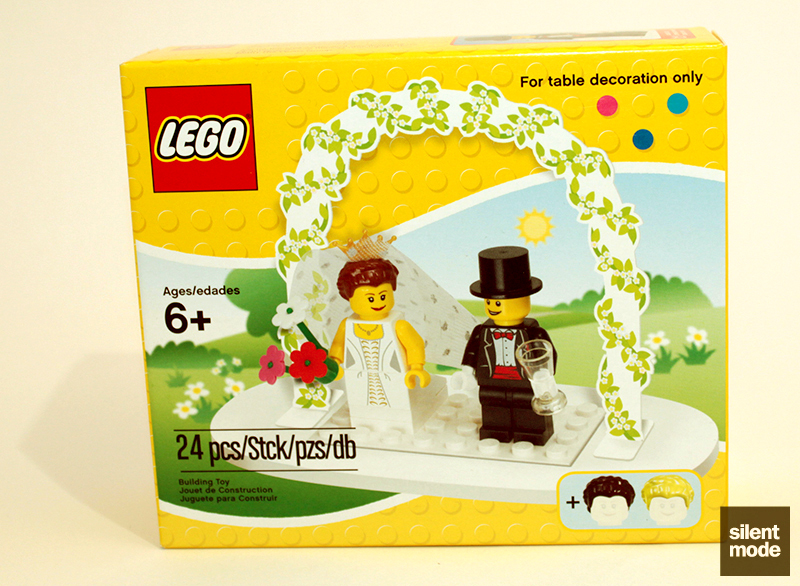 Voila, a table decoration fit for an AFOL wedding – just don’t expect to see the bride figure ever again! There really aren’t any leftovers, apart from the two spare hairpieces for the bride and any unused flower parts. 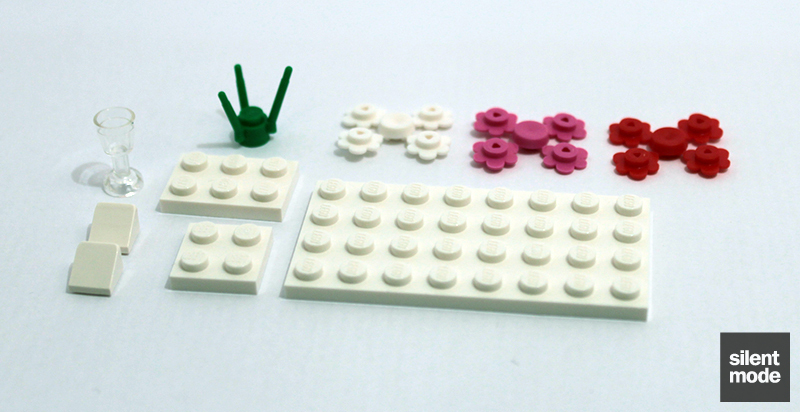 Actually, looking at the flowers makes me wish that Lego would bring them back in yellow and blue like they used to have, and perhaps some other colours. Let’s be honest: the only reason to buy this set is for the bride’s torso, and perhaps the bride’s printed slope. Even then there’s the very visible issue (in the above photos) of the two parts having their designs not line up, which is very disappointing considering it looks perfect on the box. The veil puts icing on the cake. 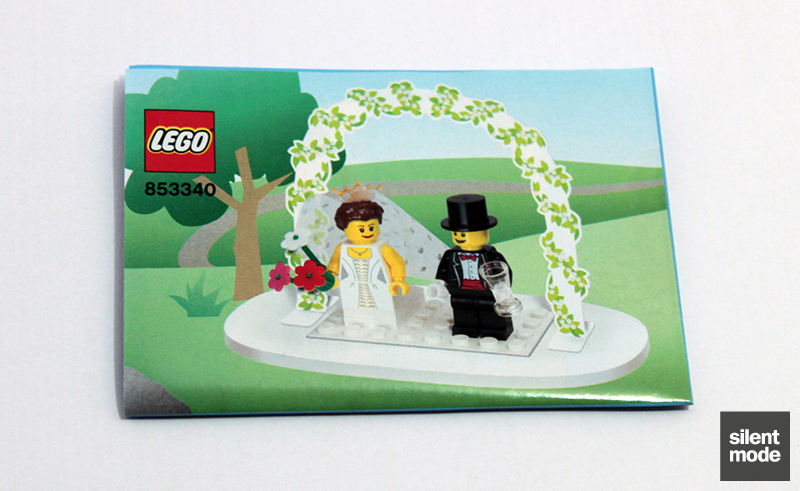 By far the biggest letdown of the set is with the groom. Although it might be a popular sentiment to ignore him, I think they should have given him a dedicated tuxedo torso – like they gave the bride a new design – instead of recycling the S1 Magician’s outfit. They could also have given him a hairpiece for when he’s not wearing his top hat, even if it’s a generic one. 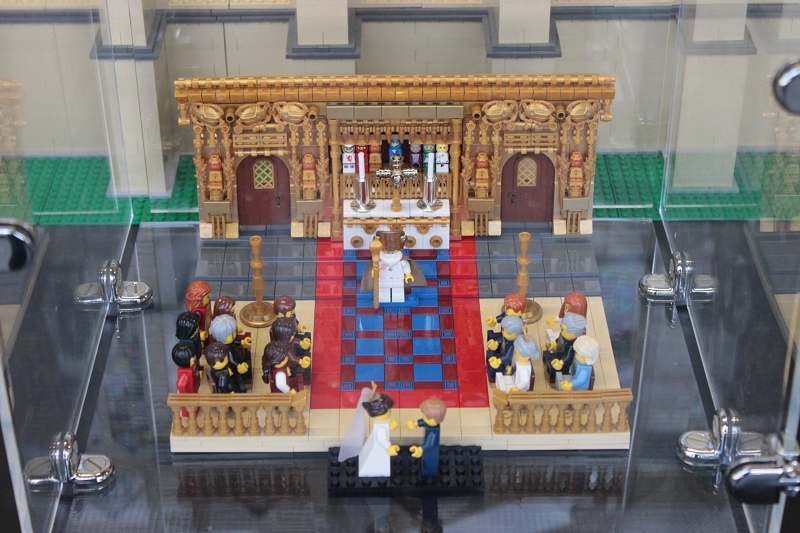 Leaving aside the non-Lego parts, which may or may not disappear eventually, the real question when thinking of buying this set is: how much would you be willing to pay for that bridal dress? 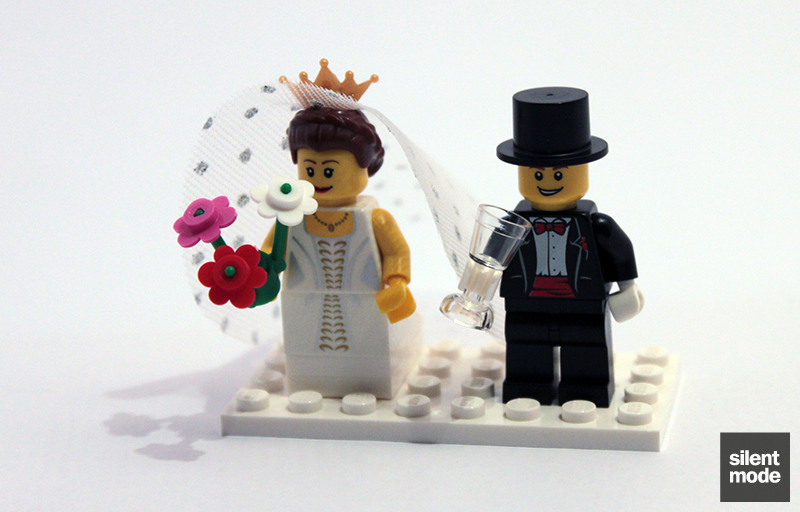 I think a very good job was done designing the bride, and although I don't mind the use of non-Lego elements in this case, more could certainly have been done with the groom. 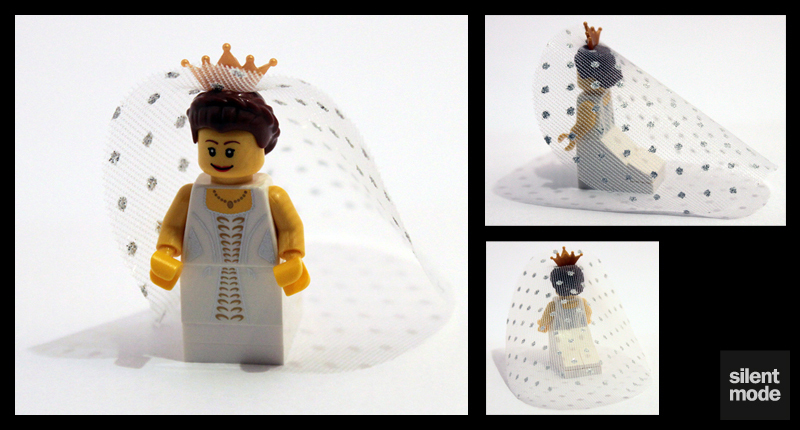 A very very simple build, given the small number of parts; attaching the veil through the tiara, as well as using the adhesive pads, might pose a challenge. 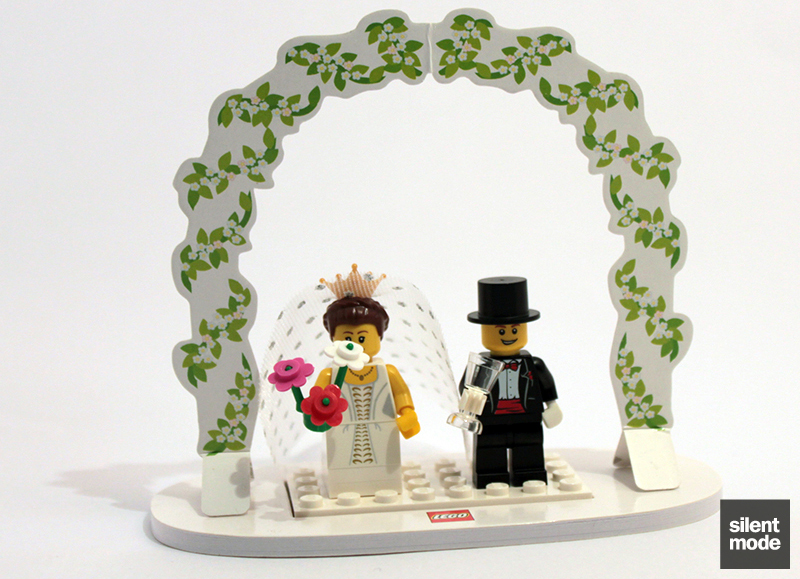 Again the set's let down by the lazy choices made for the groom, and in a small way the use of a non-Lego part for the arch. 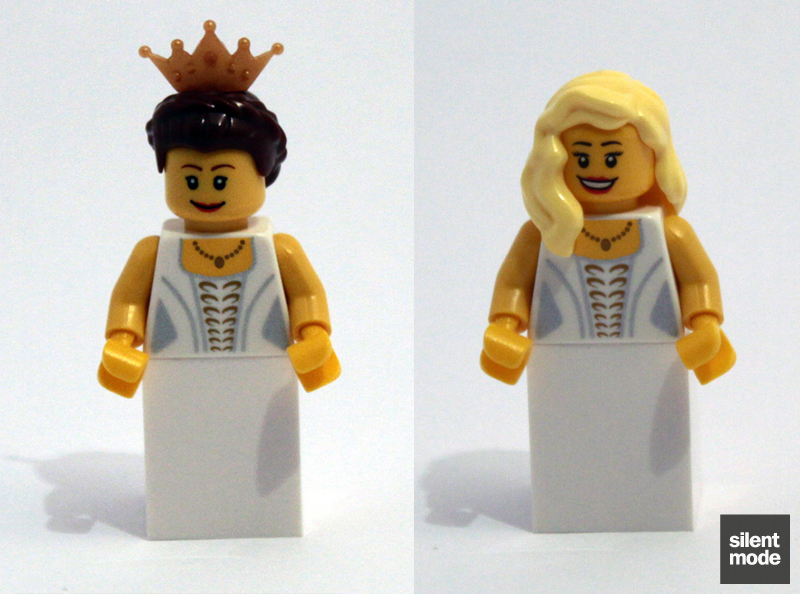 The bride's hairpiece is very uncommon, with the blonde (Bright Light Yellow) variant being exclusive to this set. I've also taken a point for the misprinted slope piece. There's not much you can do with this set on its own, as it's meant to be a table decoration. The use of plates on the bride's skirt may make placing her in a scene very tricky, but this is one area where the groom does just fine. All the parts can be put to use in other places. Given that it's going for a lot more than the RRP in other places, I don't think the price for set is that bad, especially if you're buying it for the bride's dress (I've bought a torso more expensive than this set). If you go by price per part, it may not be worth it. Based on these scores I’d give this set 6.6/10 – helped an awful lot by the bride’s dress.